Busy? Of course you are!!! Me two!!!!! We have 2 birthdays at the Beach House here today. Oh and a bit of advice. If you are trying to have a baby, do not try in March, like we did, You end up with a little bundle of Christmas joy, who just about grinds you into the ground at this time of year for many years to come, over birthday issues, Mr Beach House is also born on this day. Couldn't have planned that one if we tried. That is one thing (errhmm among many) I have in common with my mother in law, being silly enough to make out and follow though on a hot night in March.....Just plain crazy if you ask me. I am also trying to get a Christmas Mantel together before Christmas, It will be a miracle if I can pull it off before the 25th, but I am giving it a red hot go? I'll be posting that soon, along with a fantastic paint giveaway, as my Christmas present to you, but first I just had to post this simple dessert, that may be of some assistance to you over the next few days and weeks. It's red, it's Christmassy and it is oh so easy and isn't that just what we need right now, something that is eeeeeeeeesay?!!!!! Please dear God....just one thing!!!! 2 punnets of strawberries hulled. Reserve 3-4 strawberries for a garnish and cut them into strips. Blend strawberries and then strain through a sieve to remove the seeds if this is important to you. It was to me. Just push through the sieve with a spoon and scrape the bottom of the sieve to keep the coulis flowing. Add sugar and vanilla to the strawberry mixture and stir to combine. Put the mascarpone into a bowl. 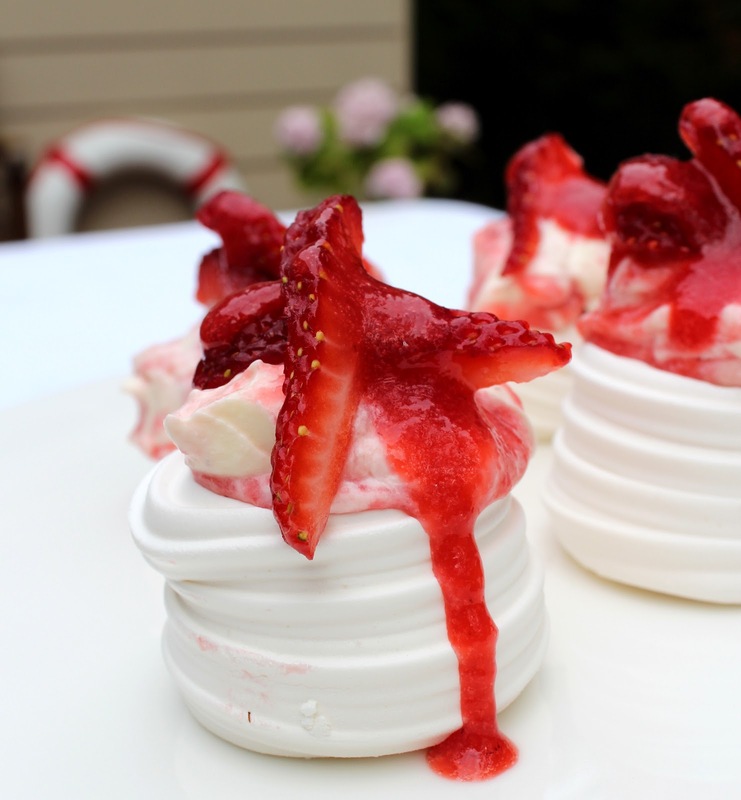 Pour half the strawberry mixture into the mascarpone and twirl it around with a chop stick, or the like, to give it a marble effect. Place a heaped teaspoon of mascarpone mixture onto your birds nests. 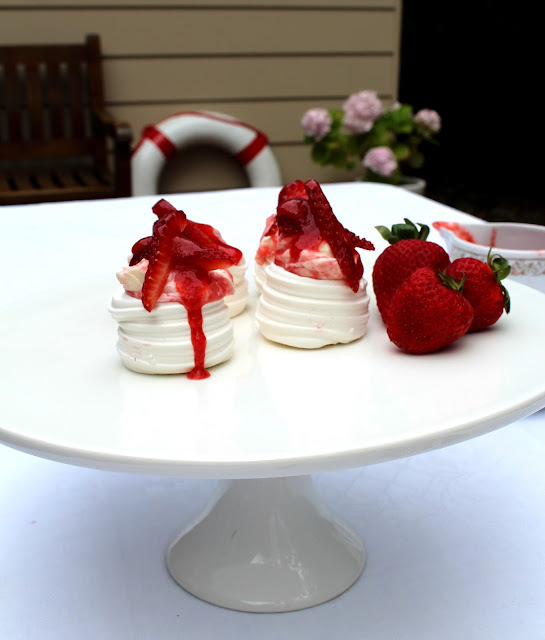 Dress each birds nest with 2 strips of reserved strawberry and drizzle each one with the remaining coulis. I put these on a platter and allow guest to serve themselves by hand. But they need to be eaten with cake forks. The recipe makes 12. Now as you were...... let the Christmas craziness continue. Here's my Christmas page if you need some ideas. That looks so lovely! 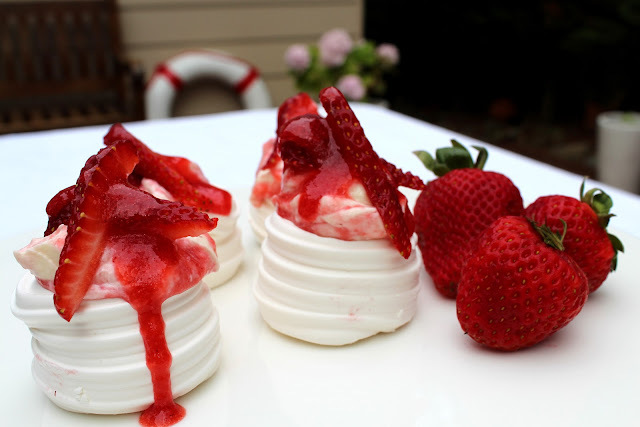 I am hoping to make a pavlova for our Christmas dessert - there will probably be just the three of us (Mr. R, young Master E. and myself), but we've asked a recently divorced friend to join us, as he will be alone for the holiday. I need to have someone to share the pavlova with, as neither Mr. R. or E. are fans... - for them, I will probably be making pineapple upside down cake. Such a busy time of year isn't it. Hope you have fun and enjoy the Birthdays today, I always feel sorry for people born in December they seem to get forgotten about with all the happenings of Xmas! Now meringues are good here being that they are GF and all, I love them with mango and passionfruit on top too! they look lovely for xmas! 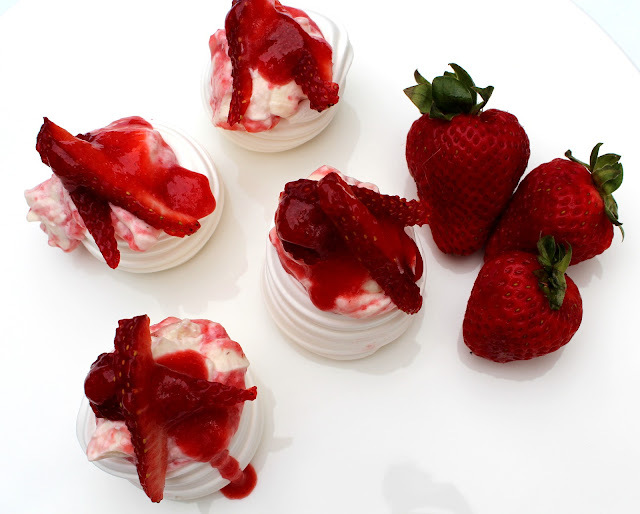 my mum is making mini pavlovas for dessert. This is a beautiful dessert. I have never seen meringue bird nests for sale in the supermarket(any market).